The best way to get to know a community is by scheduling a tour. See the facilities, meet the staff and residents, and get a feel first hand what it's like to live at Copper Creek Cottages of Mattoon Memory Care. 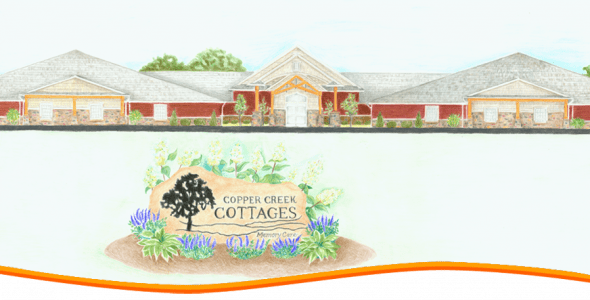 Copper Creek Cottages of Mattoon, Illinois is currently under construction and opening Spring 2017. Mattoon’s premier provider of memory care, the community is conveniently located near Interstate 57 and Sarah Bush Hospital. Our community features 30 apartments, in 2 intimate settings of 15, to provide better care and attention to each of our residents. We offer 1 and 2 bedroom apartments for single or double occupancy, both with private bathrooms. Our home includes walking paths and visual cues, such as varied cottage home-fronts for comfort and memory recognition. Our amenities and services are based on a personal level and encourage residents to explore, touch and choose their activities. We believe that every stage of life is to be embraced and enjoyed, and the same is true for people living with memory loss. It is our hope to help your loved one greet each day with courage and wellness on their journey. Copper Creek Cottages' Promise Is To Make A Difference Everyday! We specialize in detail! At Copper Creek Cottages, living space is integral to balanced living for residents. Our residents live as independently as possible within a smaller, more comfortable environment specifically designed to decrease anxiety, confusion and depression. Residents can participate in organized daily exercise, walking outdoors in the courtyard, games, occasional outings, music and other activities. We also tailor one-on-one activities to meet individual’s needs. We at Copper Creek Cottages Memory Care are here for you and your loved one. Please feel free to contact us with questions, to learn more about our services and amenities, to schedule a tour or inquire on employment. A member of our team will be in touch.